As Australia reaches for its 28th year of uninterrupted economic growth – the longest on record among developed countries – the question on investors’ minds is whether this run is about to end. The Chinese have long considered the number eight as lucky. Here, we explore whether there are enough supporting factors – including those coming from China – to make the ‘eight’ in 28 lucky for Australia. With an overinflated housing market, significant residential property construction activity over the past few years and a banking sector that has tightened lending standards meaningfully, the economy faces a number of challenges. Further, Australia-wide house prices have now fallen for 13 consecutive months with a peak to current date fall of c.6 per cent (as at September 2018). Sydney and Melbourne house prices have fallen by 16 per cent and 9 per cent, respectively. The combination of slowing credit growth, falling investor demand and a pullback of foreign interest, with Chinese investors featuring highly, implies that construction activity is likely to slow sharply. Add to this weak equity markets pointing to overall wealth effects, which are now clearly turning negative. It is easy to build a case for why Australia may not achieve another year of uninterrupted growth. However, despite all these worries, to date, the consumer has remained resilient; as chart 1 suggests, both sentiment and retail sales as indicators are holding up well thus far. House prices: a soft landing or a crash? It is important to remind ourselves that the fall in house prices is a direct result of public policy initiatives. The banking regulators’ macro-prudential policies, introduced to curb speculative activity, primarily targeted interest only loans and investor segments. Higher taxes had been introduced for foreign investors and developers at multiple levels. The banking royal commission added the impact of banks tightening their lending standards, as it rightly called into question lending practices. 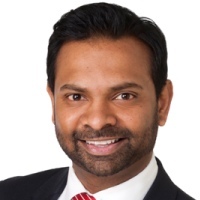 Capital requirements, including an adjustment to risk weights, and rising funding costs have also caused banks to reduce credit availability to certain segments such as property developers. However, to date, there has not been any meaningful pickup in non-performing loans and forced selling of residential properties as a result of foreclosures. The labour market remains relatively healthy and we expect this to be the case going forward. The elevated construction activity has only taken the supply of dwellings from a position of undersupply a few years ago, to roughly in balance. While there are pockets of higher supply (e.g., high rise apartments in and near central business districts), Australia’s healthy population growth means additional stock continues to be absorbed quickly. This, coupled with improving affordability for many first-time home buyers and those who were excluded from home ownership over the past decade, means oversupply is not a major threat as it was in other overseas markets. While news headlines routinely speculate drastic price falls of 40 to 50 per cent, we believe the fall in house prices is likely to be more orderly with peak to trough falls in major capital cities of 15 to 20 per cent. As chart 2 suggests, much of this adjustment is already underway. This is consistent with other countries with similar housing markets, banking systems and regulatory policies such as Canada where the fall in prices occurred a year or two earlier. Australia’s growth has long been a story of rotating contributions from different sectors of the economy. With Australia having largely bypassed the Global Financial Crisis (GFC), the experience over the past decade has been a series of adjustments rather than any specific slowdown (see chart 3). Over this time, the economy has transitioned from a mining investment boom to tourism and education exports (from a falling dollar), then to a housing construction boom driven by easy monetary policy and now to the early stages of a multiyear substantial infrastructure build by the government. 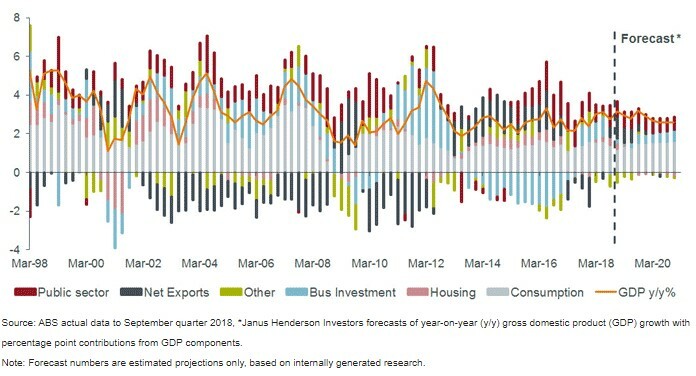 Pulling all of these threads together, the story of growth in Australia is one where economic growth is likely to migrate from above trend towards the country’s gross domestic product (GDP) potential. But a severe slowdown is not expected. We believe the key to how the Australian economy will unfold over the coming year and beyond lies with the strength of the labour market. The unemployment rate in Australia has continued to drift lower to around 5 per cent. and the Reserve Bank of Australia (RBA)’s expectations are for this to migrate towards 4.75 per cent. We would agree. While wage inflation has been relatively subdued, the participation rate (including female participation) has been rising accompanied with an ongoing pickup in hours worked. Put simply, the economy has more work for more people delivering more income. All of this combined has led to disposable household income rising by 4 to 5 per cent despite relatively flat wage growth. 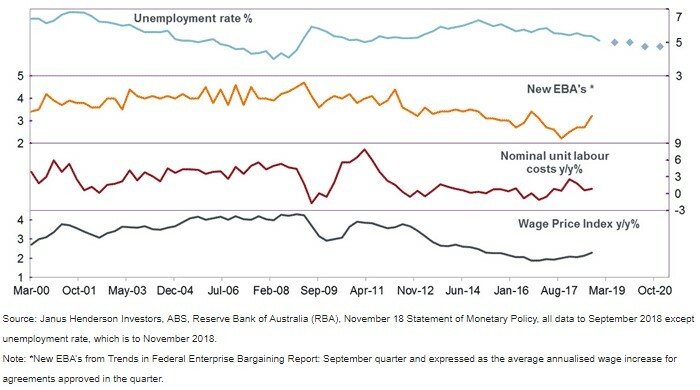 Looking forward, the low point in wage inflation also seems to be behind us with wages in a number of areas picking up, including Enterprise Bargaining Agreements (EBA), see chart 4. Supporting the labour market is consumption, public sector investment and net exports while housing construction adjusts lower. Specifically in relation to exports, China remains firmly our number one export partner and therefore, China’s growth outlook as well as the composition of their growth remains an important factor for Australia. While it can be debated how China’s growth rates will unfold over the years ahead as they deal with their own debt challenges, our view is that China will continue to grow above developed economy growth rates. Australia’s vulnerability to China’s evolving growth is likely to be contained as the Chinese authorities navigate and transition their economy. Fixed asset investment in China is still running at around 6 per cent per annum, which continues to support the traditional commodities exports. More importantly, however, for future exports, China is becoming an increasingly large importer of other parts of Australian services including education, tourism, business services and agriculture. This is becoming very evident in the official data. Monetary policy: while cash rates by historical standards are low, by global standards the RBA still has 150 basis points (bp) of ammunition should it be required. The governor of the central bank recently highlighted this, and their willingness to act if required, including any use of unconventional monetary policy. Fiscal policy: Australia’s fiscal position has improved markedly over recent years with the budget likely reaching a surplus shortly. The Australian government remains one of the few in the developed world with relatively low levels of debt and an ‘AAA’ credit rating. Currency: The open nature of the Australian economy with its flexible foreign exchange regime has held it in good stead during past episodes of economic slowdowns. Any swift currency depreciation has worked effectively as an ‘automatic stabiliser’ in stimulating exports. Even the recent c.10 per cent fall in the Australian dollar is likely providing some degree of growth pulse over the year ahead. While it is easy for investors to conclude that Australia’s run of economic growth is coming to an end with a housing slowdown, a closer balanced analysis of the economy would indicate otherwise. We believe that Australia again will transition growth to other segments in 2019 and reach its 28th year of uninterrupted economic growth.